The dominant theme in John Locke’s seventeenth century work is that improvement in the human condition is both possible and desirable. Locke presented a view of human progress and the transformation of nature that was unknown to the ancients. He argued this improvement could best be achieved by challenging the existing economic system of mercantilism and feudalism and the notion that monarchs had the divine right to rule. What joins commerce with republicanism is the rule of law, which, in turn, rests on the centrality of contracts and consent. Locke envisioned the essential unit of analysis to be the autonomous individual in a state of nature free from social restraints and governmental regulations. Locke, however, portrayed this natural position as one of abject poverty. Nevertheless, since God gave the world to man to enjoy and improve, the rational and industrious who take care of themselves by using the useful arts and sciences are to be held in the highest regard. Through the privatization of God’s gift of common property—a sort of contract with God – individual liberty and the general well-being are advanced. Locke undermined primogeniture in the economic world and also the divine right of kings in the political world. Legitimate government only existed by the consent of autonomous individuals who willingly surrendered the right to adjudicate disputes and relinquished the power necessary and proper to make laws for the well-being of the community. The rights of the people did not come from the government; rather the powers of the government were a conditional grant by the people. All the more reason, then, to separate the powers and limit the reach of government to specified objects with the people retaining control over the vast areas of their life. Thus the birth of the commercial republic. The Smith Foundation Adam Smith also focused on improving the human condition by increasing the wealth of the nation. Poverty was to be solved by increasing production, which depended on the productivity of labor, which was strongly influenced by the division, or specialization of labor that depended, finally, on the extent of the market. Humans not only have a natural inclination to self-preservation; the butcher, the baker, and the brewer also have a natural inclination to “truck, barter, and exchange” beef, bread, and beer with other humans. No “human wisdom” or governmental planning is needed to create this cooperative outcome. 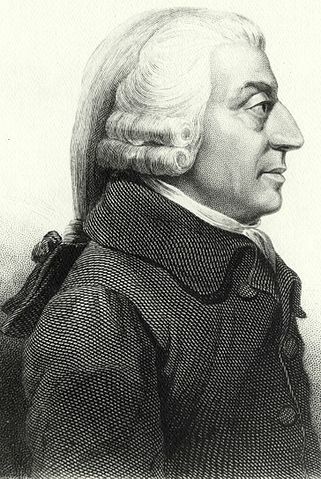 Adam Smith also focused on improving the human condition by increasing the wealth of the nation. For Smith the practical arts and sciences enhances the natural progress from a primitive agricultural community to a “civilized and thriving country.” In such a society, the government is not extensively involved in the day to day operations of production nor the proto-crony capitalistic granting of special privileges to a few companies. The presumption is that individuals know what is in their best interests and that a concern with self-interest is not the same as personal greed or self indulgence. A commercial society requires its habitants to adhere to the values of hard work, thrift, and moderation. On the other hand, there is a strong presumption from the critics of a commercial republic that selfless and enlightened administrators can determine the level and kind of production necessary for an efficient economy and better society. According to the Framers, a republican form of government is where a) a scheme of representation takes place in contrast to both a monarchy and a pure democracy; b) there is a separation of powers between the legislative and executive branches; c) the judiciary shall be independent of the political branches; and d) the legislative branch shall be bicameral. There is also e) a provision for frequent elections by the people with room for debate about the mode of election, the length of term of office, should the terms be staggered, and who can vote and who can run for office. Federalist No. 10 and Federalist No. 51 incorporated Locke’s defense of private property and Smith’s extended market in their defense of a commercial republic: the purpose of government is the protection of private property and the well-being of the nation depended on the presence of economic, political, and religious liberty. Article I, Section 6 indicates that “Senators and Representatives shall receive a compensation for their services.” This underscores the commercial nature of the republic. The Constitution also provides safeguards against the corruption that goes along with money. (See Article II, Section 1, Article III, Section 1 and Amendment XXVII.) In addition, Congress has the power to grant temporary patents “to promote the progress of science and the useful arts.” And there are specific restrictions on Congress and the States with respect to granting “titles of nobility.” There is no provision for primogeniture in the distribution of property and the divine right of kings in politics is replaced by the consent of the governed through regular elections. In short, we are a commercial republic. 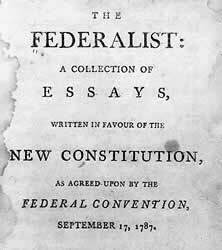 Among the 18 clauses in Article I, Section 8 outlining the powers of Congress, the first eight and the eighteenth establish the constitutional foundation for a commercial society. What does the Interstate Commerce Clause mean and has its meaning changed over time? Is it possible to draw a clear line between intrastate and interstate commerce as the Supreme Court in the New Deal era attempted to do? What exactly is commerce? What does regulate mean? Again, the New Deal, the Great Society and Obamacare programs relied on a very expanse rather than a restrictive interpretation of the meaning of this clause. There are 27 amendments to the Constitution, 20 of which are the result of decisions made during the three main “eras” in American public policy: ten from the founding, three from the Civil War era, and seven from the Progressive era of the twentieth century. Five out of ten of the Founding amendments, one out of three of the Civil War amendments, and four out of seven from the twentieth century deal directly or indirectly with a commercial republic. The most important foundational amendment is the Fifth, which states that no person shall “be deprived of life, liberty, and property, without due process of law; nor shall private property be taken for public us, without just compensation.” There are all sorts of questions that have emerged. What is private property? Do the rules of due process change over time? Who determines “just compensation?” What burden of proof must the government meet to warrant the takings of private property “for public use? “Do the different claims of private property and public use actually put commerce and republicanism on a potential collision course? The important point is that this amendment reinforces the attachment of the republic to a commercial society where to take away private property has to be done according to the rule of law. One of the most controversial aspects of a commercial republic is the possibility that there may be no limits on what people can own and trade. Can a person own another person and then sell them on the open market? A strong argument can be made that free labor and slave labor are inconsistent with each other; a commercial society and a feudal/slave society cannot subsist together. The Thirteenth Amendment removes the tension by eliminating slavery from the United States. The 44 words in Section 1 of the Eighteenth Amendment are intended to introduce a remarkable change in our commercial republic. In popular terminology, this section prohibited and criminalized the purchase and consumption of alcoholic beverages. Americans, for most of their history, accepted that the Constitution limited the reach of the federal government to few and defined objects leaving the rest of public policy to state and local governments or to the private commercial sector. 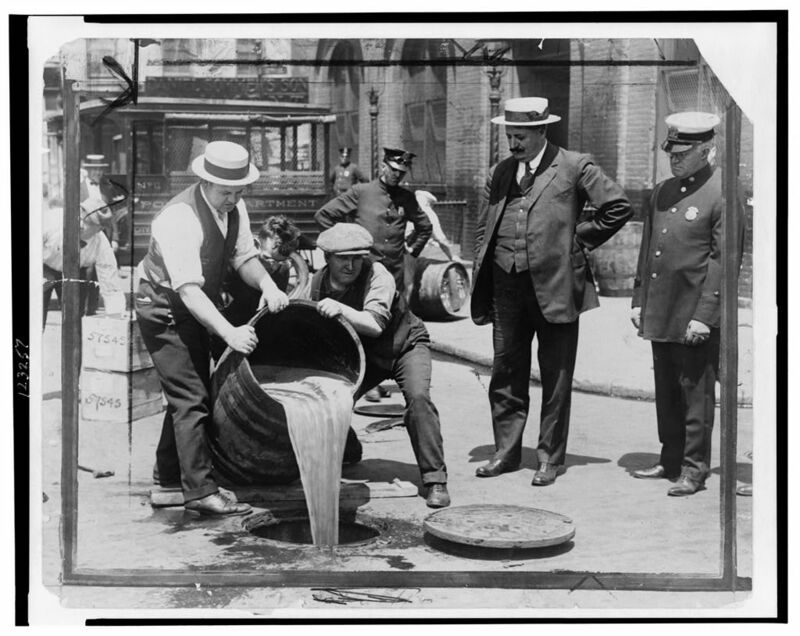 An important feature in Section One of the Eighteenth Amendment, therefore, is that it introduces the proposition that we as individual Americans are not free to engage in the commerce of certain beverages. A politically decentralized and commercial nation overwhelmingly accepted the argument that drinking was a moral issue beyond the scope of the market and vital for the well-being of the republic. What was not anticipated was the endurance of entrepreneurial politics in American life. Section I does not mention the words, “purchase,” “consumption,” and “alcohol.” What is there is the phrase “intoxicating liquors.” What are “intoxicating liquors?” This ambiguous language is not accidental; it reflects the persistence of entrepreneurial politics in America. The Twenty-First Amendment that overturned the Eighteenth Amendment confirmed that we are indeed a commercial (federal) republic. The progressives also relied on a loose interpretation of Article I, Section 8 to regulate the relationship between capital and labor or what they called “the social question.” They provided a significant challenge to the traditional understanding of the role of government in a commercial republic. They introduced three new cabinet departments: the Agriculture Department, the Labor Department, and the Commerce Department. The roles of these departments have expanded over the last hundred years in an effort to control rather than encourage the operation of a commercially based republic. For the progressives, equality replaces liberty as the central concern of both economics and politics. And this challenges the very nature of our commercial republic.